Looking for a good summer read...er...listen? Good news. STRONG BOY: THE LIFE AND TIMES OF JOHN L. SULLIVAN, AMERICA'S FIRST SPORTS HERO is now available as an audiobook. 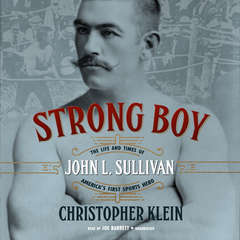 Approaching nineteenth-century sports and boxing with a twenty-first-century perspective, STRONG BOY brings to life John L. Sullivan, a man who was the gold standard of boxing for more than a decade and the first athlete to earn more than a million dollars. He had a big ego, big mouth, and bigger appetites. His womanizing, drunken escapades, and constant presence on the police blotter were a godsend to a burgeoning newspaper industry. The larger-than-life boxer embodied the American Dream for late nineteenth-century immigrants as he rose from Boston's Irish working class to become the most recognizable man in the nation. The "Boston Strong Boy," was our nation's first sports hero, and his name was not Babe Ruth. STRONG BOY has been called "one of the best boxing books ever penned" by the Boston Globe and "a muscular, relentlessly detailed book" by the Wall Street Journal. In addition to the paperback version, the audiobook version of STRONG BOY is available through Audible at Amazon as well as Barnes and Noble, iTunes and Indiebound.